Hello Loves. It's time again for a nail school update, and I've got nuthin'. Sheesh, this past week has been horrible. I guess it's only fitting, being the 13th week and all. Not that I'm superstitious or anything. So what DID I get done this week? 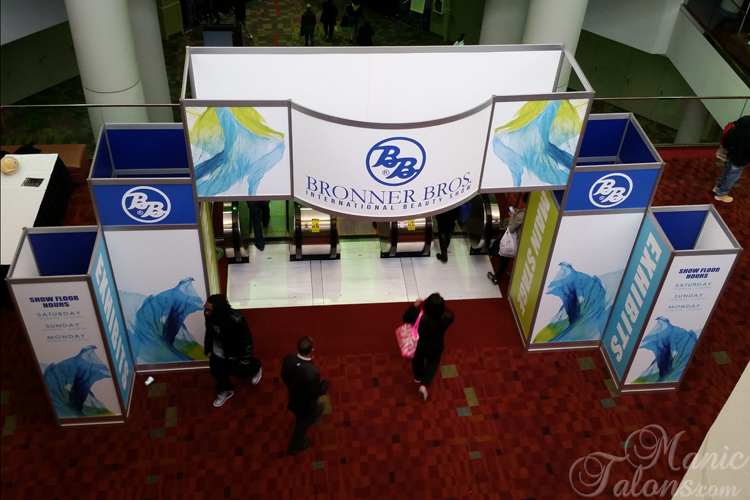 Well, despite the bronchitis, I did make it to the Bronner Bros. International Beauty Show. THAT was an adventure! And this is the only photo I managed to snap while I was there. As for the actual show, I only found three nail booths and they were so packed I could barely get close enough to tell what was up. So I wandered around for a little while taking in the sights and called it a day. Wouldn't you know it, I got lost on the way home too. Grrrr. Monday was NOT my day, but it certainly set the stage for the rest of the week. 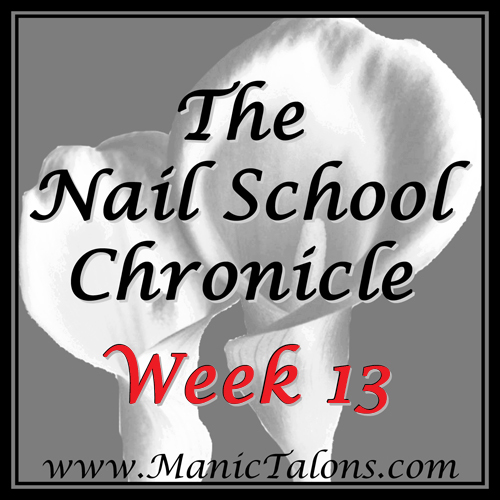 So, that's my summary of Week 13 of nail school. Between holding sick babies and being sick myself, I did manage to do something kind of fun - if you consider writing hour after hour of html code fun. If you follow me on facebook, you might remember me asking a few weeks back if you would be interested in a new swatch gallery by color instead of brand. Since I had several positive responses, I decided to build it. It's not quite finished, but close. Very close. As in so close I hope to launch it this Wed! So here's a screenshot collage of my progress. I hope you're as excited by it as I am. Goodness knows I way underestimated the amount of work it would take to build! I didn't realize I have swatched over 500 colors in the year and a half since I started this blog. 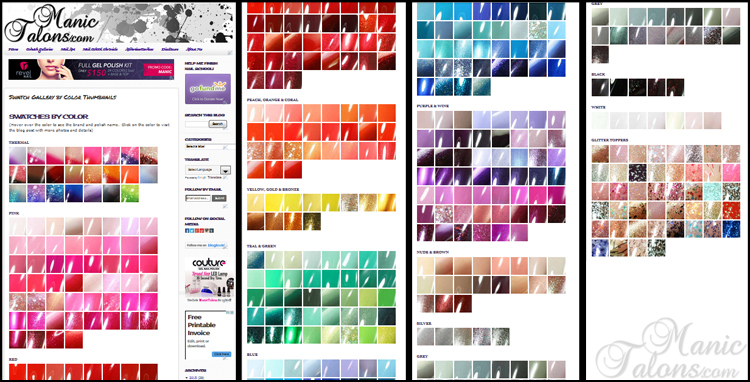 All of those thumbnails are crops of my actual swatch photos, organized as best I could by color. Each one links to the blog post where you can see full swatch photos and details for the colors. Thanks so much for your hard work on the galleries. One thing I would really like is the swatch to indicate if a review is included. Thank you! Thank you! Thank you! for the onerous task of making a by-color swatch gallery! I'm getting so tired of buying similar colors and dupes, and I'm sure that others who aren't loyal to a single brand feel the same way. Wow those swatch galleries look amazing! So far nobody seems to have the nerve to comment on your navigationally challenged issues. Well, I am here to relate!! Long live GPS, my salvation. I was an airline flight attendant for years and my husband liked to say "She can fly around the world, but she can't find her way around the block!" I"m guessing you"ll get that.......Looking fwd. to your Up2U review. Cheers. Lynette PS I was also a math major in college.......supposedly people good at math are good at directions.....well, obviously not always!!! Ha!